In the United States, chronic peritoneal dialysis take-on has declined among incident ESRD patients. Although increasing age, co-morbidity, and body size may explain part of this decline, other factors likely contribute. 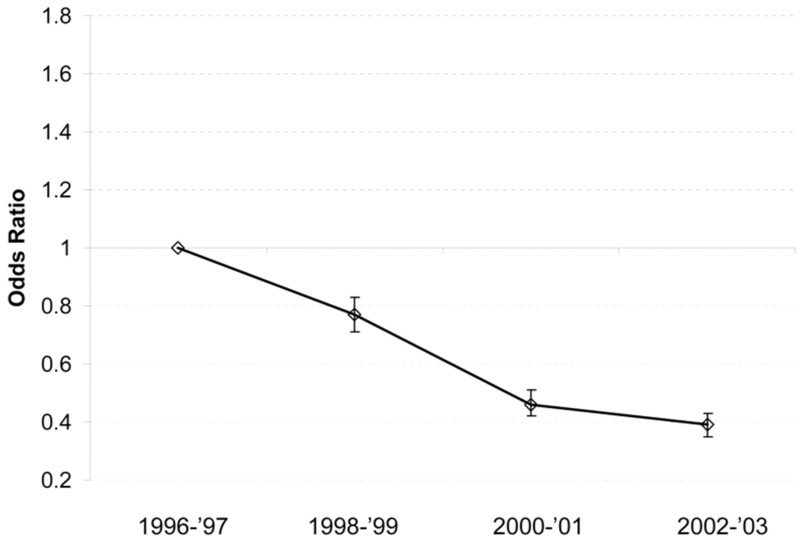 Among incident ESRD patients in the United States, we found that peritoneal dialysis take-on significantly decreased from 11% in 1996 to 1997 to 7% in 2002 to 2003 (P < 0.001 for the trend). This decrease remained after adjusting for patient demographics, case-mix, and laboratory data, suggesting the involvement of other factors. 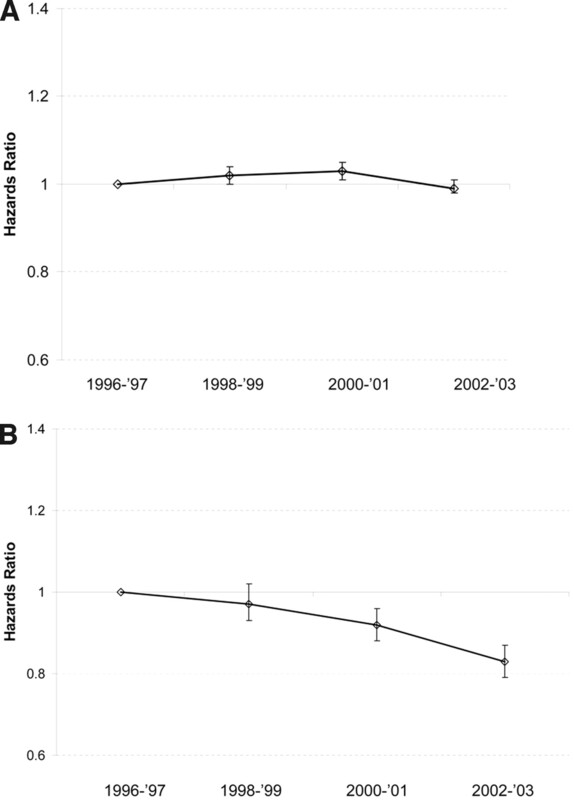 This decline in utilization occurred during a time of improving outcomes for incident peritoneal dialysis patients, measured as reduced hazards for death or for the need to transfer to hemodialysis. In contrast, among patients initially treated with hemodialysis, the 12-month adjusted hazards for death or transfer to peritoneal dialysis slightly worsened or were unchanged over this same period. Therefore, the decline in peritoneal dialysis take-on cannot be entirely explained by increasing age, co-morbidity and body size of incident ESRD patients. The decline in utilization has occurred at a time when the early outcomes of CPD patients have improved. The proportion of incident patients who have ESRD and undergo CPD has progressively declined starting in 1985, a trend that has accelerated since 1995.3 Even though the determinants of modality selection are largely nonmedical, attention has been drawn to two medical issues and their potential relationship to modality selection.4 First, it has been argued that increasing age, comorbidity, and body size among the incident ESRD population is responsible, at least in part, for the decrease in CPD take-on. With an aging, more obese, and sicker incident patient population, further decline in CPD use would be inevitable.5,6 Second, several studies have raised concerns that the outcomes among CPD patients may be inferior to those of MHD patients.7–9 This has led some to question the viability of CPD as a renal replacement therapy (RRT). We undertook this study to test two hypotheses: (1) The decline in CPD take-on in the United States is independent of the change in age, comorbidity, and body size of the incident patients with ESRD, and (2) the outcomes of CPD patients have improved over time independent of the demographic and clinical changes in the incident CPD population. The 8-yr study period was divided into four cohort periods: period 1 (P1), 1996 to 1997; period 2 (P2), 1998 to 1999; period 3 (P3), 2000 to 2001; and period 4 (P4), 2002 to 2003. During the 8-yr period, there were a total of 670,875 adult incident patients with ESRD. The characteristics of the patients over the four study periods are summarized in Table 1. Given the large number of patients in each cohort, all of the trends over time were highly significant (P < 0.001). Over the four study periods (P1 through P4), the average age of the patients increased by 1.5 yr, and there was a gradual increase in the proportion of Hispanic patients as well as those who were retired at the time of start of ESRD therapy (Table 1). There was a small but consistent increase in the proportion of patients with hypertension as the underlying cause of ESRD and the proportion with preexisting ischemic heart disease but a decrease in the proportion of patients with preexisting congestive heart failure or history of myocardial infarction (Table 1). Over the four study periods, the mean body mass index (BMI) of the incident patients with ESRD increased by 2.0 kg/m2 (Table 1). Of the 670,875 incident patients, 606,777 were undergoing maintenance dialysis on day 90. The proportion of patients undergoing CPD on day 90 progressively declined from 10.9% during P1 to 7.1% during P4 (P < 0.001 for the trend). A progressive decrease in CPD take-on was observed in all age groups of the incident patients over the four periods, in patients with or without selected coexisting illnesses or risk factors identified on Medical Evidence Form 2728 and each of the four categories of BMI. The decrease in CPD take-on with each of the four periods was confirmed on multivariate analyses. Using P1 as the reference period and adjusting for demographics, the odds ratio (95% confidence interval) for patients starting CPD declined with each period: P2, 0.76 (0.74 to 0.78); P3, 0.70 (0.68 to 0.71); and P4, 0.64 (0.62 to 0.65). The odds ratios were attenuated on adjustment of data further for case mix (P2, 0.77 [0.72 to 0.84]; P3, 0.46 [0.42 to 0.51]; and P4, 0.40 [0.36 to 0.44]) or for case mix and laboratory data (P2, 0.77 [0.71 to 0.83]; P3, 0.46 [0.42 to 0.51]; and P4, 0.39 [0.35 to 0.43]; Figure 1). The concordance rate (c statistic) for the fully adjusted model was 0.74. There was a significant interaction between BMI and CPD take-on, such that the greatest decrease in CPD use occurred in individuals with BMI <19 kg/m2 (Table 2). Odds ratios (95% confidence intervals) for CPD take-on for each of the four cohort periods. Using 1996 to 1997 as the reference period and adjusting for demographics case mix and laboratory data, the odds ratio for patients starting CPD were as follows: 1998 to 1999, 0.77 (0.71 to 0.83); 2000 to 2001, 0.46 (0.42 to 0.51); and 2002 to 2003, 0.39 (0.35 to 0.43). The change in the characteristics of incident MHD and CPD patients over the four cohort periods is summarized in Tables 3 and 4, respectively. For both MHD and CPD patients, the mean age and BMI of the patients increased as did the proportion of Hispanic patients and those who were retired at the time of start of ESRD therapy, but there was a decrease in the proportion of patients with preexisting congestive heart failure or a history of myocardial infarction. Whereas the proportion of incident MHD patients with preexisting ischemic heart disease increased, the corresponding proportion among incident CPD patients decreased. The data on 12-mo technique survival was available on 542,690 (98.6%) of the 550,435 MHD patients; the breakdown for individuals with missing data were as follows: P1, 2017 (1.8%); P2, 2040 (1.5%); P3, 2215 (1.5%); and P4, 1473 (0.9%). There was no significant change in the unadjusted 12-mo technique survival of the incident MHD patients over the four cohort periods (Table 5). Similarly, using P1 as reference, there was slight worsening or no change in the adjusted hazards for death or transfer to CPD in the subsequent periods (Table 6, Figure 2A). The interactions of black race and retired employment status with the period of study were statistically significant, but subgroup analyses showed similar trends in each group. These interactions, therefore, were not included in the final model. Sensitivity analyses using only the observations with complete data for all observations (n = 314,764) produced almost identical results (data not shown). (A) Hazards ratios (95% confidence intervals) for incident MHD patients to either die or transfer to CPD during the first 12 mo. Using 1996 to 1997 as the reference period and adjusting for demographics, case mix, and laboratory data, the hazards ratio for patients starting MHD were as follows: 1998 to 1999, 1.02 (1.00 to 1.04); 2000 to 2001, 1.03 (1.01 to 1.05); and 2002 to 2003, 0.99 (0.98 to 1.01). (B) Hazards ratios for incident CPD patients to either die or transfer to MHD during the first 12 mo. Using 1996 to 1997 as the reference period and adjusting for demographics, case mix, and laboratory data, the hazards ratio for patients starting CPD were as follows: 1998 to 1999, 0.97 (0.93 to 1.02); 2000 to 2001, 0.92 (0.88 to 0.96); and 2002 to 2003, 0.83 (0.79 to 0.87). The data on 12-mo technique survival was available on 55,587 (98.8%) of the 56,242 CPD patients; the breakdown for individuals with missing data were as follows: P1, 221 (1.5%); P2, 169 (1.2%); P3, 186 (1.3%); and P4, 79 (0.6%). There was a progressive improvement in the 12-mo technique survival of the incident CPD patients over the four cohort periods, largely as a result of reduction in mortality (Table 5). Using P1 as the reference period, the hazards ratio for death or transfer to MHD progressively decreased for each successive period (Table 6, Figure 2B). No significant interactions between demographics, case mix and laboratory variables, and period of study for outcomes of CPD patients were identified. Sensitivity analyses using only the observations with complete data for all observations (n = 32,260) produced almost identical results (data not shown). To our knowledge, this first systematic analysis of the trends in CPD take-on and outcomes of incident ESRD patients allows us to make two important observations. First, the decline in CPD use in the United States is independent of age, comorbidity burden, and body size of the incident ESRD population. Second, the hazards for death or transfer to MHD among incident CPD patients early during the course of ESRD progressively declined during the 8-yr period starting in 1996. During the same period, the outcomes for MHD patients remained largely unchanged. Each of these two findings may have important implications for the future of CPD as a RRT in the United States. Studies suggest that 76 to 93% of incident patients do not have any medical contraindications for CPD,10–13 yet only 25 to 33% of patients starting maintenance dialysis in United States are offered the choice of CPD, a probability unaffected by presence of relative/absolute contraindications to the therapy.11,14 Limited education of trainees and relative inexperience of physicians in the care of CPD patients may partly, although not entirely, explain the historically low CPD take-on in the United States.6,15 Furthermore, there has occurred a progressive decline in the use of CPD by incident patients with ESRD.3 It has been suggested that it may be partly accounted for by the aging incident population with a higher comorbidity burden and larger body size.5,6 We systematically explored this hypothesis in this study. During the 8-yr period of the study, during which CPD take-on decreased dramatically, the incident ESRD population in the United States became older, and CPD take-on does progressively decrease with increasing age. However, our analyses show that CPD take-on decreased in each age stratum examined, and the decrease in CPD use was largely independent of the increasing age of the patients. Moreover, there was no significant increase in either the prevalence of diabetes or reported comorbidity on form 2728 among the incident ESRD population. This suggests that the decrease in CPD use during this period may be unrelated to the comorbidity burden of the patients starting RRT. Finally, even though the BMI of the incident population increased, the decline in CPD take-on was, paradoxically, inversely related to the body size of the patients. Therefore, increasing prevalence of being overweight or obese is also unlikely to be an important cause for the decrease in CPD use. The results of this study do not provide information on the cause of the steep decrease in CPD take-on in the United States. The decline occurred in every subgroup examined, and on multivariate analyses, each period of study was an independent predictor of CPD take-on. This suggests that the decline in CPD use in the United States is a result of something more pervasive and widespread in the system of delivery of dialysis therapy. The increasing dominance of chains, proliferation of MHD units without a parallel investment in CPD infrastructure, a higher use of injectables among MHD patients and financial gains associated with them, emphasis on small solute clearances as a measure of “adequacy” during the 1990s, and publication of studies showing poorer outcomes with CPD in some subgroups of patients have been cited as potential reasons for this decline. However, none of these hypotheses has been systematically investigated in this report, and these remain speculative. This analysis also shows that this decline in CPD take-on occurred at a time when the outcomes of incident CPD patients progressively improved whereas that of MHD patients remained unchanged. In this study, we used a composite outcome of death or transfer to an alternative dialysis modality, because a change in dialysis modality is a significant morbidity for patients with ESRD and is expensive for the health care system. The US Renal Data System (USRDS) reports have indicated that the mortality of CPD patients during the first few years of therapy is significantly lower than that of MHD patients, and this has further decreased.16 For CPD patients, the probability of transfer to MHD, and for MHD patients, the probability of death or transfer to CPD have remained largely unchanged. However, the USRDS report does not account for the change in the demographics and comorbidity burden of the incident CPD population. As is apparent from our study, the age and body size of the CPD patients increased in concert with the incident dialysis population during the 8-yr period of study, but the comorbidity burden decreased significantly. It is possible that some of the apparent improvement in outcomes was attributable to a healthier CPD cohort over time. However, as our multivariate analyses show, the probability of reaching a composite outcome of either death or transfer to MHD was progressively and significantly lower during each of the 2-yr periods between 2000 and 2003, when compared with outcomes for incident patients during 1996 to 1997. Our data are also consistent with the report from the Baxter database wherein the investigators reported a progressively lower probability of transfer of CPD patients to MHD during a 3-yr period of study (1999 to 2001).17 However, those data were adjusted only for age, gender, diabetic status, center size, calendar year, and CPD modality. Our study extends the observations of their study by using a composite outcome of death or transfer to MHD and by a more extensive adjustment for demographics and comorbidity. This study does not allow us to determine the causes for the improvements in outcomes. During the period of study, there was a progressive reduction in peritonitis rates, largely because of a greater use of disconnect systems and use of exit-site antibiotic prophylaxis.18,19 In addition, the dosage of delivered dialysis progressively increased over time.20 Furthermore, many more centers are using continuous quality improvement programs that may have led to these improvements. Finally, both better outcomes and decreased take-on may be a result of more stringent criteria used to select patients who embark on CPD therapy in the United States; however, the role of these and other changes in the improved outcomes remain speculative. The study is not without its limitations. First, on the basis of our analyses, we cannot exclude residual confounding, particularly because the coexisting conditions or risk factors may be underreported on Medical Evidence form 2728.21 Moreover, no information was available on the severity of the individual coexisting conditions or risk factors. However, this problem is likely to be randomly distributed over each of the four periods of the study; therefore, it is unlikely to have biased results. Second, our analyses were limited to a 12-mo period starting from day 90 of ESRD. Some outcome studies have raised concern that the relative risk for death increases over time among patients undergoing CPD.9 In light of our findings, it is important to examine the trends among patients with increasing CPD vintage using more contemporary data. Third, the data for several variables were incomplete. Our analyses on the entire cohort and in the subset of patients with no missing data for any observation produced almost identical results, so the missing data are unlikely to have biased our results. In a national sample of the US ESRD population, the steep declines in CPD use cannot be explained by the change in age or disease burden or body size of the incident population. This decline in CPD use occurred at a time when the outcomes of CPD patients during the first year progressively improved whereas that of patients undergoing MHD remained unchanged. The data for this study were procured from the USRDS. The USRDS Core CD containing information on all incident dialysis patients for the period 1996 through 2003 was obtained and used for analyses. Of the 687,903 adult (>18 yr) incident dialysis patients, the data on 17,028 were excluded for the following reasons to eliminate possible errors arising from data entry: Age >100 (n = 21), weight <30 or >150 kg (n = 16,207), and serum albumin <0.5 or >5.0 g/dl (n = 824). The study protocol was reviewed and approved as exempt by the institutional review board at Harbor-UCLA Medical Center. Two key measures were used for analyses. First, CPD take-on was computed for each of the four cohort periods. CPD take-on was calculated as the proportion of incident dialysis patients undergoing any form of CPD on day 90 of ESRD. Second, the 12-mo technique failure for incident MHD and CPD patients during each of the four periods was determined. The 12-mo period was used in this study so that the outcome of patients who were incident in 1996 could be compared with those in 2003; for patients who were incident in 2003, only 12-mo outcome data were available at the time of analysis. For MHD patients, technique failure was defined as either death or transfer to CPD and for CPD patients as either death or transfer to MHD during a 12-mo period, starting day 90 of ESRD, after censoring for transplantation. Follow-up was censored on day 455 of ESRD for all patients when they were alive and undergoing RRT with the same dialysis modality as on day 90 of ESRD. Continuous data are expressed as means ± SD and categorical data as percentages. A dummy category, “missing,” was created for each variable to account for missing observations. Furthermore, categorical variables were created for age (<40, 40 to 50, 50 to 60, 60 to 70, and >70 yr and missing), BMI (<19. 19 to 24, 25 to 29, and ≥30 kg/m2 and missing), plasma hemoglobin (<9.0, 9.0 to 10.0, 10.0 to 11.0, and >11/0 g/dl and missing), serum albumin (<3.0, 3.0 to 3.5, 3.5 to 4.0, and >4.0 g/dl and missing), and GFR (<7.0, 7.0 to 8.5, 8.5 to 10.0, 10.0 to 11.5, and >11.5 ml/min per 1.73 m2 and missing). Sensitivity analyses were performed on the subset of patients with complete data for all variables. Multivariate logistic regression analyses were performed using data for all of the incident patients during the 8-yr period to determine the effect of cohort period on CPD take-on. Three different models were tested: Adjusted for demographics only (age, gender, race, ethnicity, ESRD network, employment, and insurance status); demographics and case mix (cause of ESRD, each of the coexisting conditions or risk factors reported on form 2728, and BMI); and demographics, case mix, and laboratory data (hemoglobin, serum albumin, and estimated GFR). For formally testing for the effects of age, comorbidity, body size, and other variables on CPD take-on, interactions between age, gender, race, ethnicity, employment and insurance status, and body size with period of study were tested. For evaluation of the effect of comorbidity, interactions for only the conditions with a prevalence of at least 15% in the study population were tested. The significant first-order interactions were included only when the statistical significance persisted in the fully adjusted model. Similar analyses were performed for technique failure for both incident MHD and CPD patients, after censoring for transplantation. Interactions were tested to determine the effect of age, comorbidity, and body size on outcomes. Multivariate Cox proportional hazards regression analyses were performed to determine the effect of cohort period on 12-mo technique survival. Three models were constructed: Adjusted for demographics only (age, gender, race, ethnicity, employment, and insurance status); demographics and case mix; and demographics, case mix, and laboratory data. The interactions of black race and retired employment status with the period of study were statistically significant, but subgroup analyses showed similar trends in each group. These interactions, therefore, were not included in the final model. All analyses were performed using SAS 9.1 (Cary, NC). P < 0.05 was considered statistically significant. R.M. serves as a consultant for Novartis and Shire, has received research grants from Genzyme and Shire, and has received honoraria from Baxter Health Care. K.N. is a member of the speaker's bureau and/or serves as consultant for Amgen, Abbott, and Merck. This research was supported in part by National Institutes of Health grants RR18298 (R.M. ), RR03026 (D.K. and K.N. ), RR11145 (D.K. and K.N. ), RR14616 (A.N., D.K., and K.N. ), and MD00148 (K.N.). Additional support for this work was provided by grants from Satellite Health (R.M.) and DaVita Research Grant (R.M. and K.K.). A.N. is supported by Richard Rosenthal Dialysis Fund. This article was presented as a free communication at the annual meeting of the American Society of Nephrology; November 14 through 19, 2006; San Diego, CA. We to acknowledge the assistance of Ed Vonesh, PhD, in the statistical analyses of the article. These data were supplied by the USRDS and the findings do not represent the opinion of the US government or the USRDS. LONG-TERM OUTCOMES IN AUTOMATED PERITONEAL DIALYSIS: SIMILAR OR BETTER THAN IN CONTINUOUS AMBULATORY PERITONEAL DIALYSIS?